I don’t usually like to think about medical things since I’m a bit squeamish in nature. 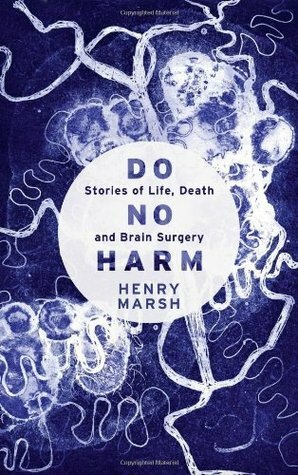 However, I was eager to read “Do No Harm” by Henry Marsh, because to me, those who perform surgery on the brain are great explorers on the same level as astronauts. Brain surgeons operate on people knowing they are cutting into their thoughts, their dreams, and their very personalities; yet, they control their fear of the process and try to improve the lives of their patients in spite of it. Henry Marsh is an expert in his field, a top British neurosurgeon, and his insights in this book are both wonderful and terrifying. He not only provides medical information about the successes and failures of his work, but also shares his personal insights into his own life and into the lives of his patients and their families. I found his insights to be the most fascinating part of this book. How do you break the news to a family that their loved one will likely die, or at best, be horribly impaired? How do you talk to a patient and their family after a routine surgery goes terribly wrong? When is surgery not the right option, and who should decide this, the surgeon or the family? How do you put past failures behind you so you can focus on the present day surgery? Henry Marsh lays out his struggles with such issues with extreme candor and humility. He also shares his trials and tribulations with the British medical system, where surgeries are often cancelled because patients will not have beds to recover in afterwards. In a time where management of our own medical system is a controversial topic, Dr. Marsh’s commentary is especially well-timed.